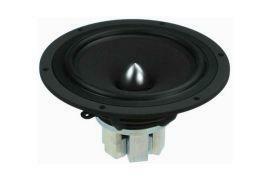 5" cone midrange driver capable of a most neutral, transparent sound reproduction. Paper cone with a unique Nextel® coating ensures smooth frequency response and low distortion resulting in low coloration in the critical midband. Patented HEXADYM magnet system of acoustically transparent design to avoid cavity resonances and air flow noise. The compact magnet system is based on six radially magnetized neodymium blocks and efectively reduces the reflexions of sound energy. Heavy copper rings mounted above and below the T-shaped pole piece to reduce non linear and modulation distortion and to increase the load capacity.